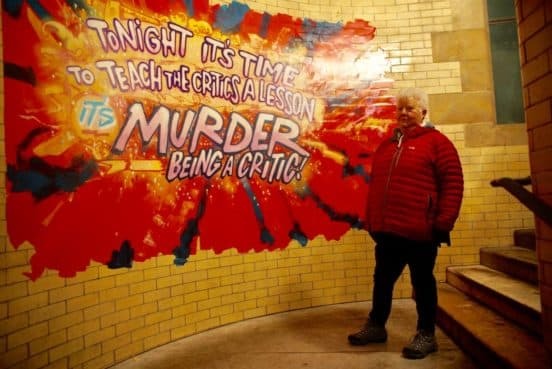 An exciting project from Scotland celebrated the country’s literary history by connecting it with modern technology by projecting messages from a new story by author Val McDermid onto some of Edinburgh’s most well known landmarks. 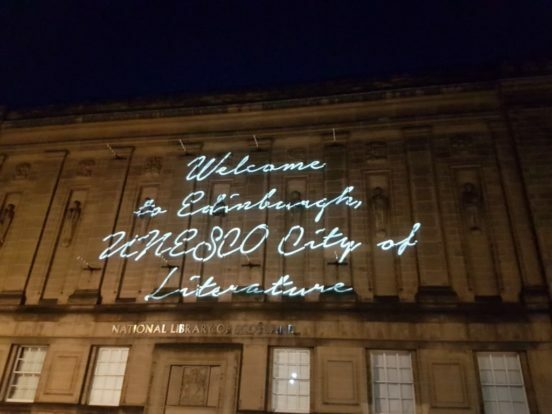 Message from the Skies was commissioned by the Edinburgh International Book Festival. It tells a story told chapter by chapter on 12 buildings and sites across Edinburgh. The project ran from January 1 to the 25th. 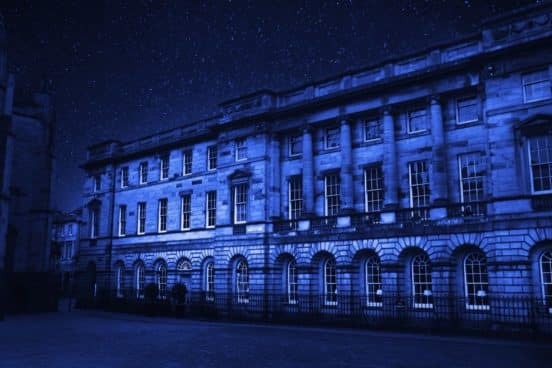 English projection company Double Take Projections worked with Scotland soundscape artists to create an exciting visual pastiche. The project kicked off on New Year’s Day, traditionally celebrated as Hogmanay in Scotland. It closes on the 25th, which is an annual festival celebrating Scottish poet Robert Burns. 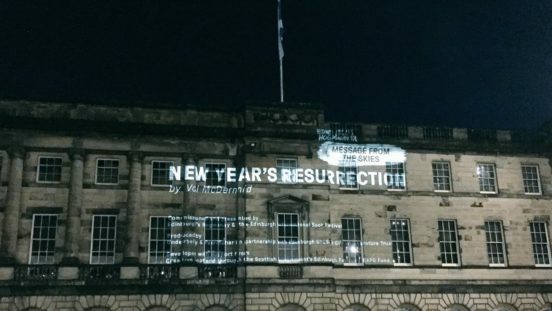 McDermid’s short story, New Year’s Resurrection, is projected onto a building. The goal was to initiate a revival of Susan Ferrier, a celebrated Scottish author and contemporary of Jane Austen. Publisher Virago has agreed to re-publish Ferrier’s first novel, Marriage, with a new forward by McDermid. Ferrier also published the novels The Inheritance and Destiny, and all three remained popular until the early twentieth century. Ferrier’s books used humor and social commentary on Scottish live and institutions, such as marriage and the education of women. A competition allowed three young people to win a prize for their own stories. 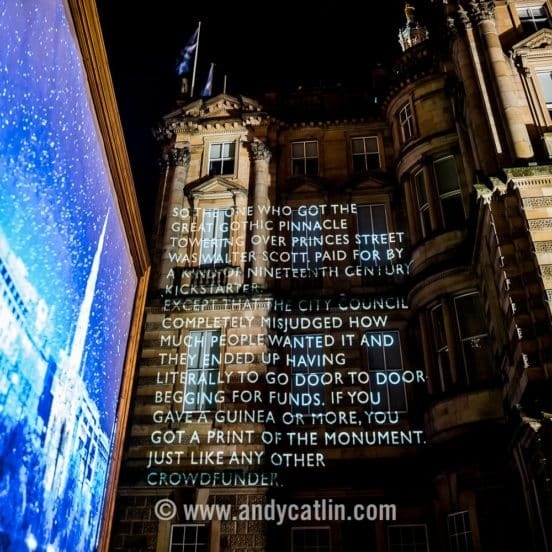 The three winners saw their stories projected each night on buildings across Edinburgh’s city centre. More than 200 people entered this competition for young writers, which was judged by a panel of experts including Ali Bowden, Director, Edinburgh UNESCO City of Literature Trust, Janet Smyth, Children & Education Programme Director, Edinburgh International Book Festival, and Boogie and Arlene from Forth 1’s Breakfast Show. Residents and visitors to Edinburgh explored the scenes on foot. The projected light forms and messages have become a trend in cities across the world, allowing people to see iconic buildings in a new way. Some of the locations have been featured in works by other Scottish novelists, like JK Rowling, Muriel Spark, Sir Arthur Conan Doyle and Robert Louis Stevenson. The ingenious structure harkens back to the nineteenth century practice of publishing novels a chapter at a time. In the Message from the Skies version of storytelling, readers go from location to location in order to view the entire story. The story started at Parliament Square, and then directed people to the next site chapter by chapter. The Bank of Scotland, Writers’ Museum, Scotsman Steps, Waterloo Place Arch, Conan Doyle Pub, Albany Street, Heriot Row, St. Cuthbert’s Church, King’s Stable Road, and Greyfriars Kirkyard are all locations in the story. The project came with an accompanying app for iOS and Android, and was available in seven languages (French, Italian, Japanese, German, Polish, Spanish and Simplified Chinese). There was also an audio description for people who are visually impaired.